DECORATIONS: All decorations must be approved by the Chapel Host. Nails, tacks, staples, glue (including glue guns), or duct tape are not to be used on any surface. Any method of decoration attachment must be approved by the Chapel Host prior to installation. All decorations must be removed immediately after the event unless other arrangements are approved by the Chapel Host. EXCLUSIVE CATERER KITCHEN USE: This use of the Kitchen is limited to Caterers from our Exclusive Catering list. Additionally, only Exclusive Caterers may drop off food at the Chapel. All equipment, except the dishwasher, is available and must be used in accordance with the manufacturer’s instructions (Operating manuals available in the kitchen). Chapel dishwasher is not available for outside use. Dishes, flatware, utensils etc. owned by the Facility are not available for use without a previously contracted rental fee (see Rental Coordinator for information on kitchen rentals). Kitchen clean up, removal of all glass (bottles etc.) from the facility, and removal of all Lessee and/or Caterer owned materials are the responsibility of the Lessee and must be completed within rental time frame. All trash must be bagged and placed in receptacles in the fenced area outside the front side door to the Chapel. A list of Exclusive Caterers is available from the Rental Coordinator. If there are any questions regarding kitchen use, check with the Chapel Host. SELF CATERED KITCHEN USE: There is a $200 Self-Catering fee for this use of the Chapel Kitchen. Self-Catering is limited to warming of previously cooked dishes, use of available space in the refrigerator and freezer, and use of any equipment except the dishwasher. Cutting or chopping on the counters is prohibited. All other rules are the same as those for Exclusive Caterer Kitchen Use. A minimum of $100 will be deducted from the Damage and Cleaning deposit in the event that any of the rules are violated. 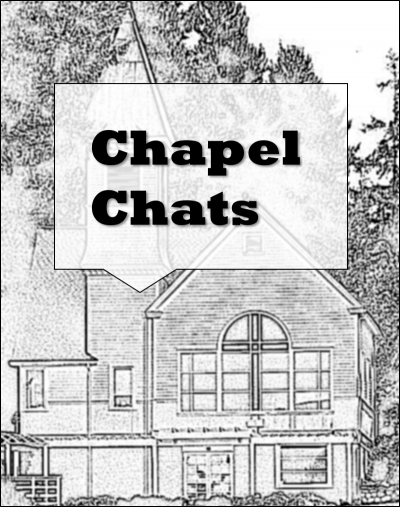 FURNITURE USE: Set-Up of all tables, chairs, and other furnishings is the responsibility of the Lessee under the supervision of the Chapel Host. At the end of the event, all tables, chairs, and other furnishings are to be returned to the storage area or place of origin. Leave the large buffet table set up. REFUND OF DAMAGE AND CLEANING DEPOSIT: The Lessee or the Lessee Representative is responsible for walking through the facility with the Chapel Host at the end of the event to determine eligibility for refund of the deposit. In the event the Lessee or the Lessee Representative is not available at the end of the event period, the Chapel Host and/or a member of the Lessor organization will conduct the walk through and determine eligibility for refund. PERSONAL BELONGINGS: A locking cabinet and key is available through the Chapel Host for storage of valuables during the event. The Lessee is responsible for all personal belongings and it is requested that personal valuables be stored for safety during the event. Anything stored anywhere in the facility is at the risk of the owner of the personal belongings. At the end of the event, check all rest rooms, dressing areas, kitchen (including refrigerator, freezer, oven, etc.) reception area, the main floor, and the grounds for personal belongings. The Fox Island Chapel Preservation Society can not be held responsible for loss of any lessee property. FACILITY BOUNDARIES: The Lessee and the Lessees party must honor the boundaries of the facility including the beach. NON-SMOKING FACILITY: Smoking of any substance by any means is not allowed anywhere on the facility including the grounds and beach. SANCTUARY AREA LIMITATIONS: Food and beverages are not allowed in the sanctuary area or the main floor. Only previously approved musicians are allowed to play the piano or organ. RICE, BIRDSEED & CONFETTI The use of rice, birdseed, confetti or similar small solid material is not permitted in the Chapel or anywhere on the grounds. DIRECTIONAL SIGNS: All personal signs leading to the facility between Highway 16 and the facility must be removed by the Lessee within 72 hours after the event. Failure to do so will result in a $50.00 forfeiture of the Damage and Cleaning deposit. to stop distribution of alcohol if there is over consumption. If persons under the age of 21 are observed consuming alcohol, the Pierce County Sheriff will be summoned to handle the situation according to state law and your event will end immediately with forfeiture of at least the entire amount of the Damage and Cleaning Deposit. Other charges may result. Additionally, disregard of these rules may result at a minimum of forfeiture of the entire amount of the Damage and Cleaning Deposit. participant. Champagne fountains are not permitted and open bottles or other containers must not be left on any table unattended by the person assigned to distribute the champagne. This Special Rule applies when use and distribution of beer and/or wine is authorized in the Use Agreement in conjunction with a reception. You are required to indicate your intentions for alcohol dispensing and consumption during your event on the executed Use Agreement. The dispensing and consumption of alcoholic beverages at the Chapel on Echo Bay is subject to the rules stablished by the Pierce County Office of the Washington State Liquor Control Board and the Fox Island Chapel Preservation Society. Beer and/or wine consumption is authorized only in conjunction with a reception that is being held in accordance with the Facility Rule for Licensed Professional Caterer Kitchen Use. All alcohol is to be dispensed by a Licensed and Bonded Professional Bartender employed by the caterer. You must obtain a banquet permit for your event; these are available at any state liquor store. A copy of this permit must be supplied to the FICPS no later than two weeks prior to the event. The alcohol being served is limited to bottled beer and bottled or boxed wine; beer kegs or cans are not permitted. Open serving bottles or carafes cannot be placed on tables. Bar service must end thirty minutes prior to the event end time specified on the Use Agreement. Removal of containers is the responsibility of the caterer or the lessee.